Or, a cheap idea for your school science project. Recently I was trying to listen online to Irish broadcaster RTE1 and their excellent traditional music programme "Ceili House" on Saturday night at 21:00. This used to work but it seemed that I couldn't listen in because I wasn't in Ireland, i.e. they'd stopped the streaming feed to overseas locations. Drat, I was being cruelly deprived of my weekend fix of the old "Diddle-Ee-Aye music." Oh well, there's one easy way around that, and that is to "switch to manual" by getting out the old transistor portable and tuning to 252kHz LW. In these circumstances, having to make do with 3% distortion, 6kHz bandwidth and somewhat fadey distant reception is more than made up for by the eccentric romance involved in actually listening to an overseas LW AM radio broadcast from the land of plastic Shamrocks, non-plastic Guinness, and overpriced car insurance. Unfortunately reception of the 252kHz signal is pretty terrible in Farnborough GU14 after dark, and another foreign station is on the same frequency. This station also happens to be coming from a direction where it isn't easy to null it out by rotating the set, at least not without losing most of the desired signal too. Connecting an aerial wire to the car aerial input socket on the radio will just bring in more of the interfering station and likely as not, a lot more local electrostatic interference from mains power and other wiring. What can we do about this thorny problem? Well, there is a way that we can at least try to improve the situation and have a bit of a play, and that way is to make an external, inductively coupled resonant loop aerial. I was interested in selling some of these on Ebay to people in similar AM radio quandries, and this factor determined the basic size and shape, that being approximately A4 paper sized and of a thickness such that it can fit in a postal package less than 1 inch thick. In this way it can be sent to people in the UK on the slightly cheaper large letter rate. 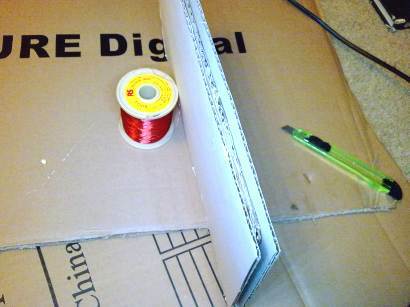 * Two pieces of single layer corrugated cardboard cut to approximately A4 paper size. 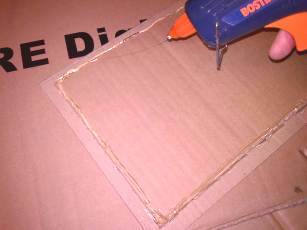 * One piece of double layer corrugated cardboard cut to approximately 1cm less than A4 size on each side. Single layer cardboard will probably do, but see later. * Enough 32swg enameled copper wire to make the winding that you need. The gauge is not critical, but you don't want it too thick or it will be expensive and the windings won't fit. * An old 100pF compression trimmer from an old radio. The value is not critical, but it helps if it's the kind with the low profile adjustment screw head and not the kind with a tall adjustment nut. * Sellotape, (Other brands of transparent sticky tape are available). PVA glue, woodworking glue or, best of all a hot glue gun. 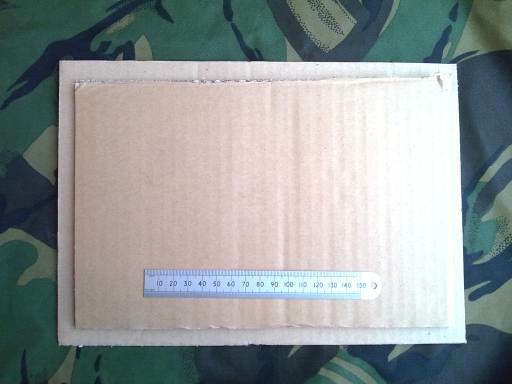 First you need to make a cardboard sandwich with the smaller piece in the middle, and the two larger pieces forming slight flanges either side. This forms a channel which you are going to wind the copper wire around. 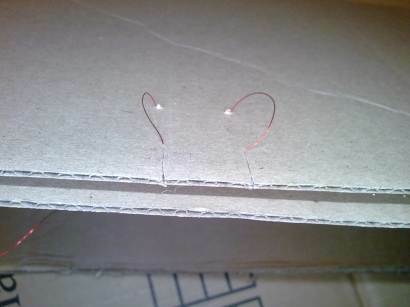 You can make this cardboard sandwich more or less however you like, it just has to be strong enough to hold together while you do the winding and there has to be something to stop the wire going down any gaps that might be left between the flanges and the filling. I used sellotape on the first model, but in true "Blue Peter" style, the best thing is most likely PVA or woodworking adhesive and a bit more patience while the glue dries. 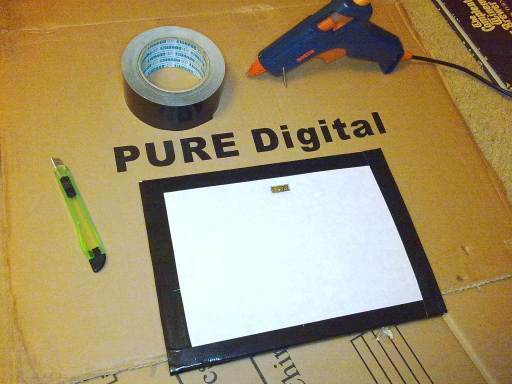 It doesn't have to be particularly strong, as we are going to stick the whole thing with gaffa tape later anyway. Seen here is the version made with hot glue. The inductance L will be approximately proportional to N squared where N is the number of turns, and resonant frequency f of the LC tank is proportional to 1/root (L). If I have this right, that conveniently works out such that a doubling of wire turns will halve the resonant frequency with a given capacitance. So for 648kHz, about half of 1287kHz. you'd want about 20 turns. The winding is started by putting a nick halfway along the long edge of one of the flanges and putting the copper wire down the nick to hold it. Wind the turns round the channel, not too tightly, and then place the far end in another nick in the cardboard next to the first one. 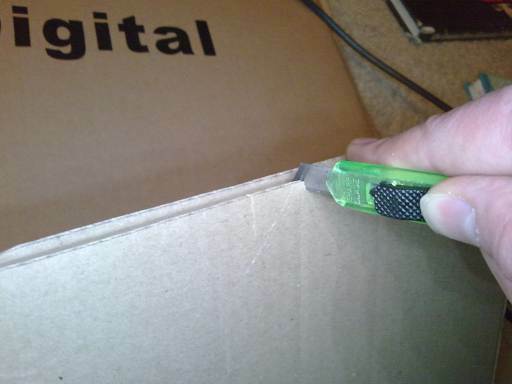 Using a sharp box knife (as always, ask an adult to help you!) 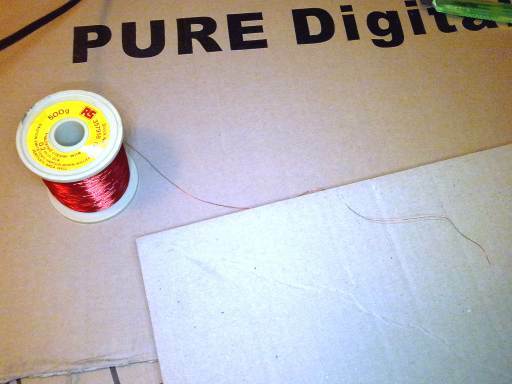 cut down through and remove the first two or three layers of cardboard on the opposite side to the nicks to create a hole in which the trimmer capacitor can sit near to the ends of the winding. Poke small holes through the bottom of the hole where the trimmer terminals will go. Feed the winding ends through from the other side and solder them to the trimmer terminals. 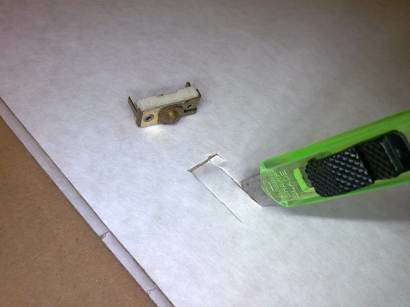 The extra length of wire needed to do this can be hidden under the trimmer as you push it back into the perfectly crafted hole and it sits there almost flush with the surface of the cardboard. 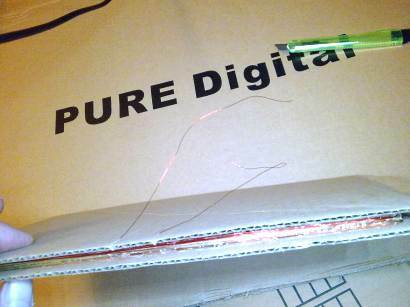 This is one reason why a double cardboard inner layer is useful, to accommodate the depth of the trimmer. At this stage it is best to test and tune your loop. If you have an RF signal generator and oscilloscope then this whole exercise is pretty trivial anyway so let's assume that you just have the radio that you intend to use. Tune in the station that you want and rotate the radio for maximum signal as usual. The plane of the loop should be such that it is in the same plane as the coil winding in the radio, or such that the length of the rod in the radio would go through the middle of the coil at right angles, as you can see in the pictures. If you were close on the number of turns guesswork, adjusting the trimmer should cause an unmistakable rise in signal at a certain point. If it is a compression type trimmer, this ideally this should be a point where the trimmer is not to tight or too loose, so that it's easy to adjust but there's no danger of the screw dropping out. Screwing in tighter on a compression trimmer gives you more capacitance and a lower resonant frequency. If you can't hear the signal peak, and it should be obvious, try using another weak station at a higher or lower frequency. If it's resonating at too low a frequency, you can take a couple of turns off the loop. If it's too high, well... you now realise that it would have been easier to err on the side of too many turns in the first instance. Now you can seal around the edges using black gaffa tape and this should conveniently cover the wire connections to the trimmer as well. That's it. The idea is to rotate your AM radio so that you can hear your distant station with the least interference from other stations and noise, and this is not necessarily the direction with the loudest signal. Then place this coil close to the side of the radio and adjust the tuning screw for best signal. There will be a very audible signal boost when correctly tuned. By tuning the trimmer off to one side, you may be able to reduce another strong interfering signal on a nearby frequency on the other side of your station. For best results you need to adjust the trimmer when the panel is already positioned in the correct position next to the radio, as the presence of the ferrite rod in the radio will adjust the tuning of the external loop slightly. If you're making a LW aerial, it's best to place it next to the end of the radio which has the LW coil in it and vice versa. 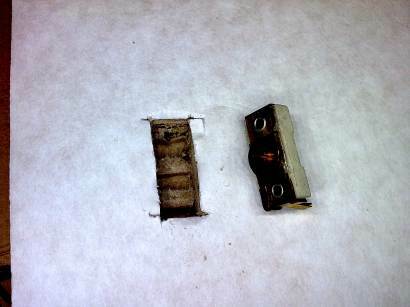 The LW coil is the one with the big thick pile of wire, and the MW coil is usually a single thickness winding. An even greater effect can be gained by using two panels placed at either end of the radio. This forms a Helmholz arrangement which guides the magnetic part of the radio signal through the internal aerial rod at both ends. Using two panels like this you might want to try tuning one a little high in frequency and the other a little low. In theory this will emphasise the outer sidebands a bit more and increase the treble content on a clean signal. AM broadcasts are 6kHz wide in audio bandwidth nowadays and most European radios still pretty much assume 4.5kHz in the IF department. A good old radio from the 1960s, while probably excellent in many respects, will certainly be quite narrow band on AM. 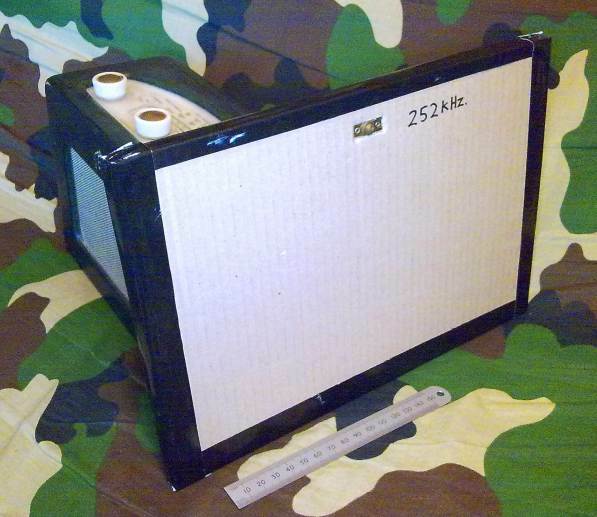 Smaller modern AM radios tend to be of poorer performance than their larger 1960s counterparts which had the big internal ferrite antennas, and are often limited by the receiver sensitivity rather than the external signal to noise ratio in the radio environment. This aerial booster is especially suited to helping listeners with those kinds of radios. Best results are obtained in daylight hours when the main problem is lack of signal strength or poor receiver sensitivity. If the problem is with interfering stations or noise on the same channel at night, then this will be less useful as it will tend to amplify both. The ferrite rod antennas in AM radios present a certain effective area to pick up the incoming radio signal. The magnetic nature of the antenna rod means that this area is bigger than the actual cross sectional area of the rod itself, but this is still quite small. This resonant loop has a much larger cross section and consequently picks up a larger amount of the radio signal. 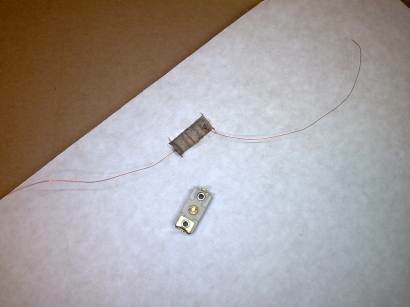 The magnetic coupling between the internal antenna and this loop aerial links the two together so that the signals received in the larger loop are induced into the smaller one. The effective antenna size is increased and the tuned nature of the external loop ensures that it emphasises only the desired frequencies. 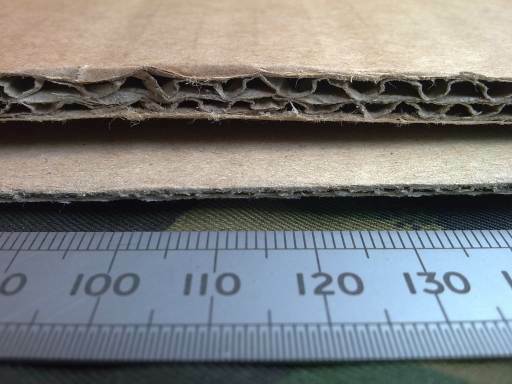 If you cut your cardboard so that the corrugations of one piece are perpendicular to the corrugations in the other pieces, and use glue on the inner layers, the resulting ply-cardboard will be extra resistant to bending in either direction. You could use a fixed capacitor made of a main one and a select-on-test smaller value chosen for each loop in parallel, but that doesn't allow you to compensate for ferrite antenna detuning. 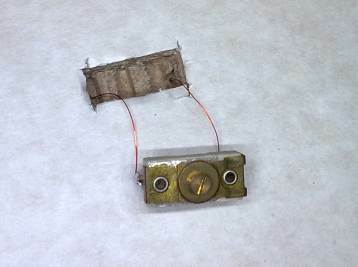 You could make the capacitor with aluminium foil plates stuck on either side of the outside panel, or on inner layers if you got the required area correct by experiment. 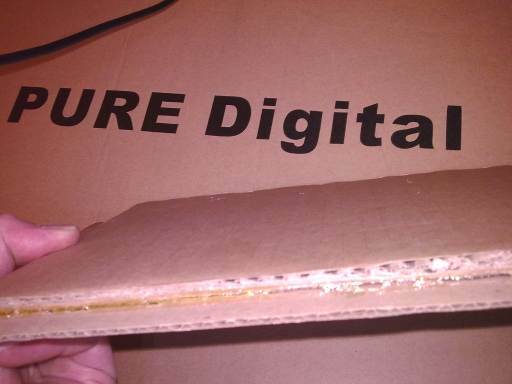 But that would again be fixed tuning, would require some trial and error and would be susceptible to moisture and different cardboard thicknesses. If you could find a way to tune it easily, this would be a neat trick and would remove the need for the bought trimmer component. If you run an LPAM (Low Power AM) station like one of the University stations or Army Garrison radio you could slap your station sticker and some adverts on one of these and give them to the punters who are outside, or even inside the main reception area. The same goes for any station really. Almost needless to say, but if you are suffering from AM interference it helps to turn off all computers, TVs, Set-top boxes, fluorescent lights etc.